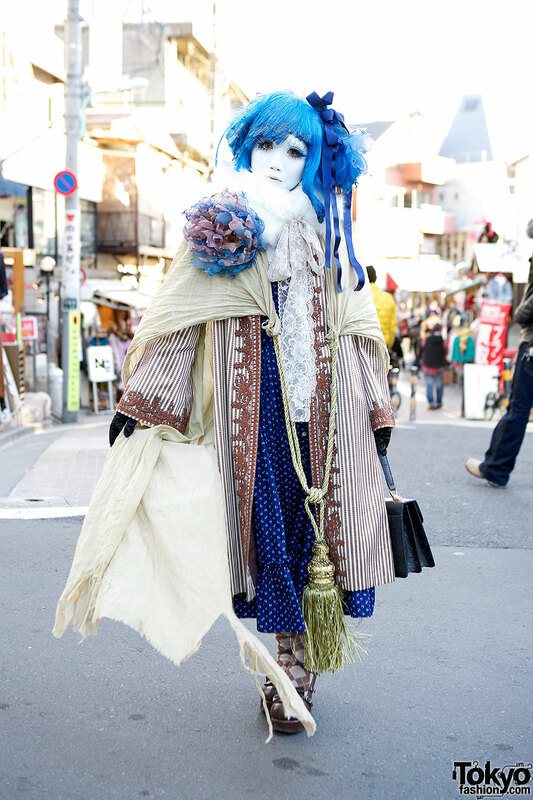 Japanese shironuri artist Minori on the street in Harajuku with a look that features a corset top, bloomers, and tall platform boots. Shironuri artist Minori with blue hair, head piece and maxi dress, accessorized with an oversized tassel and flower pin. 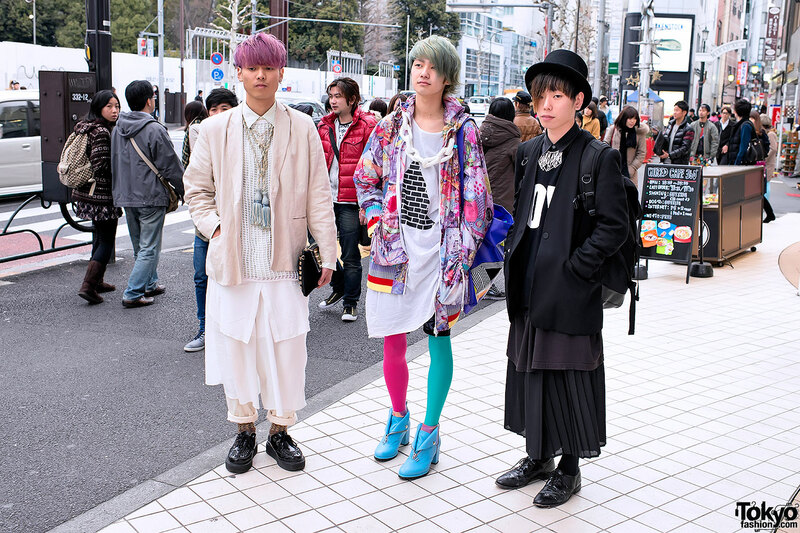 Three Harajuku guys in edgy Japanese streetwear including items from Banal Chic Bizarre, Cabane de Zucca, and Memento. Vintage-loving Japanese girl wearing a flower dress, tassel necklace, and rocking horse shoes on the street in Tokyo after dark. 20-year-old Japanese fashion student wearing a handmade dress, I am I flats and with a large tassel necklace on the street in Harajuku. 19-year-old Japanese girl with tinted hair wearing a Dolly Kei-influenced outfit featuring a tassel necklace and a remake purse covered in tassels. An indie Japanese fashion designer in a school uniform-inspired outfit with a guy in leopard-print shorts & glasses on the street in Harajuku. 19-year-old student with bright orange hair and a shorts-&-cardigan outfit by the Japanese fashion brand Murua on the street in Shinjuku. 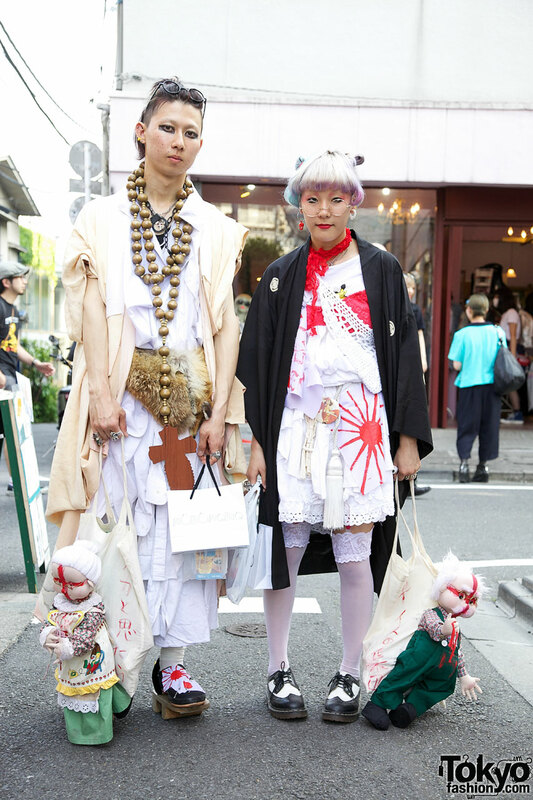 Two 18-year-old Japanese students dressed in a mix of handmade, resale, and traditional-inspired fashion on the street in Harajuku. 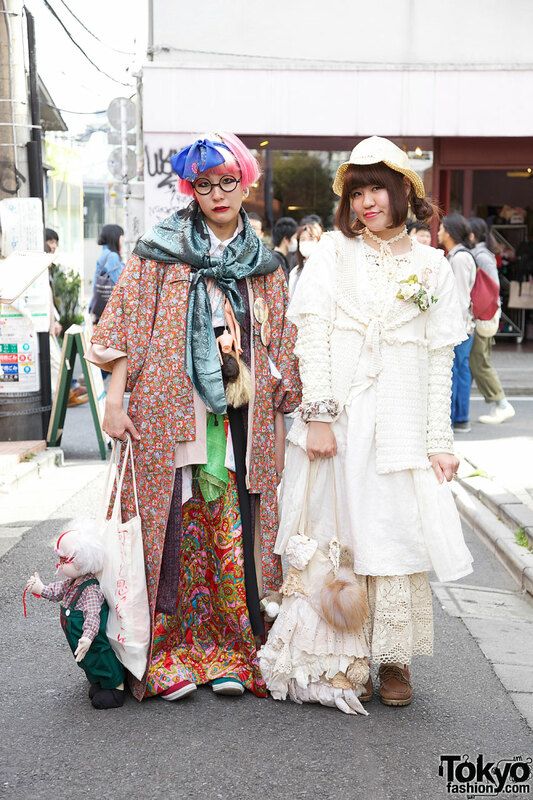 Two Japanese girls in Harajuku wearing unique multi-layered outfits featuring handmade and resale fashion – plus a large “death” doll.